ANNALEE NEWITZ is the founding editor of the science Web site io9.com and a journalist with a decade's experience in writing about science, culture, and the future for such publications as "Wired," "Popular Science," and "The Washington Post." She is the editor of the anthology "She's Such a Geek: Women Write About Science, Technology, and Other Geeky Stuff" and was a Knight Science Journalism Fellow at MIT. She lives in San Francisco. "As Walking Dead fans know, few things are more enjoyable than touring the apocalypse from the safety of your living room. Even as Scatter, Adapt, and Remember cheerfully reminds us that asteroid impacts, mega-volcanos and methane eruptions are certain to come, it suggests how humankind can survive and even thrive. Yes, Annalee Newitz promises, the world will end with a bang, but our species doesn't have to end with a whimper. 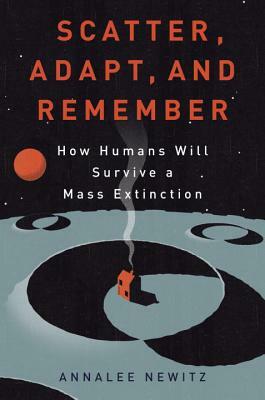 Scatter, Adapt, and Remember is a guide to Homo sapiens' next million years. I had fun reading this book and you will too." "One of the best popular science books I've read in a long, long time—and perhaps the only one that takes such a clear-eyed view of the future." "An animated and absorbing account into how life has survived mass extinctions so far…and what we need to do to make sure humans don’t perish in the next one... Humans may be experts at destroying the planet, but we are no slouches at preserving it, either, and Newitz’s shrewd speculations are heartening."